Just finished scanning my first monster property at 6,000 square feet. 99% of my scans are working but there are a few that are not registering....The scan circles are present, and I can access the area from both the floor plan and dollhouse view but just walking the property those scans are not accessible. I can see the rings, but cannot click, point, or use the arrow keys to get to them just cruising normally. I have to use the floorpan/dollhouse to get there. Anyone else experienced this? Did i space the scans too far apart? Any solutions? I experienced this recently when I scanned an outdoor patio. It was shaded so I figured it would be ok, it wasn't. It resulted in all black on the patio and those stand points (rings) were there, but unable to use them. I just disabled them and everything else was fine. There was just simply too much light. was there too much light on the affected areas? Without seeing it, I am guessing you have just spaced them apart. If you can return to the property, just add another scan in between them. 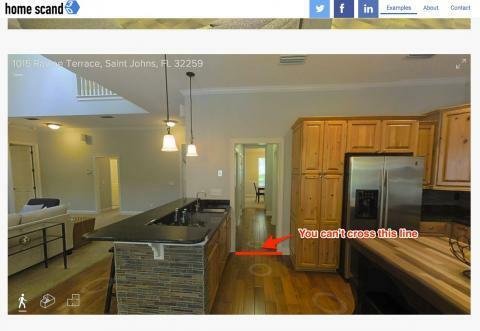 If you wanted to share the my.matterport.com link, we can tell you for sure. I noticed a scan on a friends site recently and was just checking out their scan placements. All of a sudden I ran into an issue where I was in the hall way and could't go into the kitchen. So I decided to go around. When I got to the kitchen I tried to go into the hallway but couldn't. So I asked Matterport support what was going on and their reply was: "I took a look at the model. While there is definitely something blocking the doorway to the kitchen. Its possible it is related to scanning in a loop, or perhaps a misplaced marking though its hard to tell for sure without viewing the scan map from the capture application. On a side note this model was created back in August 2014." I had the same type of issue when trying to scan around a swimming pool. I could only get about half way around and the scans wouldn't sync. So I decided to start at the doorway and go around the other way. That worked but you are not able to walk all the way around the pool using the scans. Support said this was a issue when scanning in a loop. The area I am having trouble with is an outdoor covered patio. Sun was going down and this patio is huge...Its about 12-15ft wide and the covered ceiling is about 12ft high. So there was plenty of shade in my opinion, but Im guessing I was wrong. The funny thing is once I use the dollhouse view to access those points I can move freely between them. If I want to come back inside the house I am unable to reach the scan closest to the door but can reach the scan just past the window to enter... Here is the tour.